There's not much to tell you about techniques here. It's just basically paint, doodle, add a rubon, glue some Dresden, paint some more, wrap some beads and wire. You just have to learn to play, and experiment with color and pens. Look for a spot of contrast and add some more color. Black outlines the color and makes it pop! The metal piece I stuffed into the brush portion is a smashed jewelry part! I added metallique paints for a dash of color. that comes with the little doll, wings, and crown. I used a doll mold and paper clay to create the cute little face. The rest is up to you and your imagination. Bill thought she looked like a little Totem Pole, so that's what we're calling her. She hangs on the the wall easily using the hole in the top of the paintbrush. Cool! I hope you are inspired to create and play. These are all the products and their links to the RCAG store. 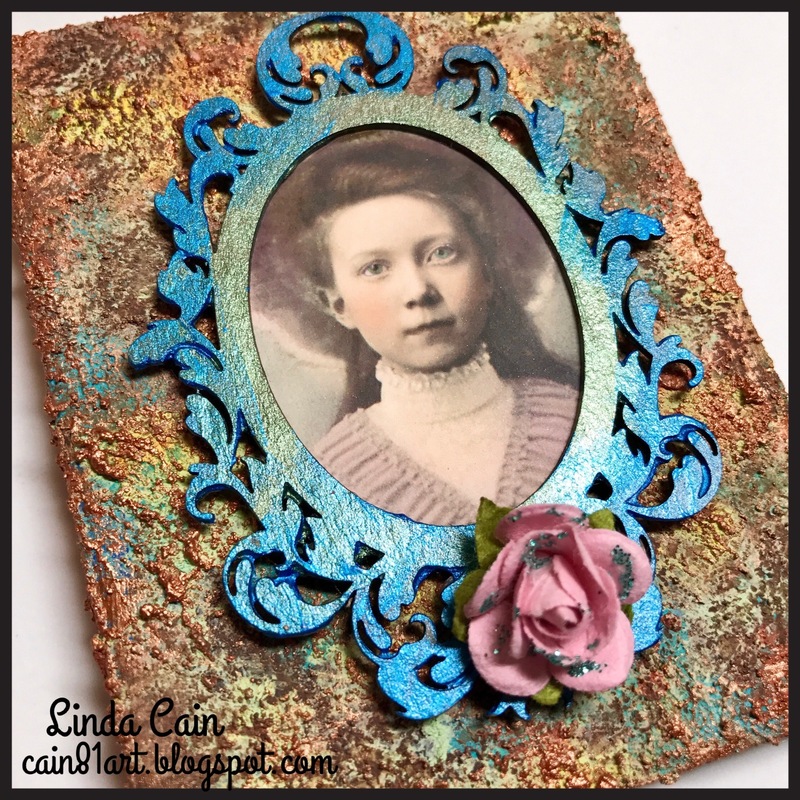 I LOVE to work with vintage photos and this project is now one of my favorites. Having said that, it's truly one of the easiest and quickest ones I have ever made. I used a bit of Jade and Cobalt Impasto paints to start here , but they are almost completely covered up with the next steps. Next I added the Mint Green and Blue Patina Pastes, and then some the Rust Pastes. I apply the pastes with an old brush. 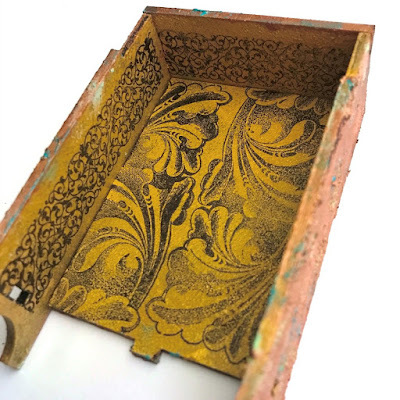 The last layer is the gorgeous Brass Patina Paste to the raised textures. 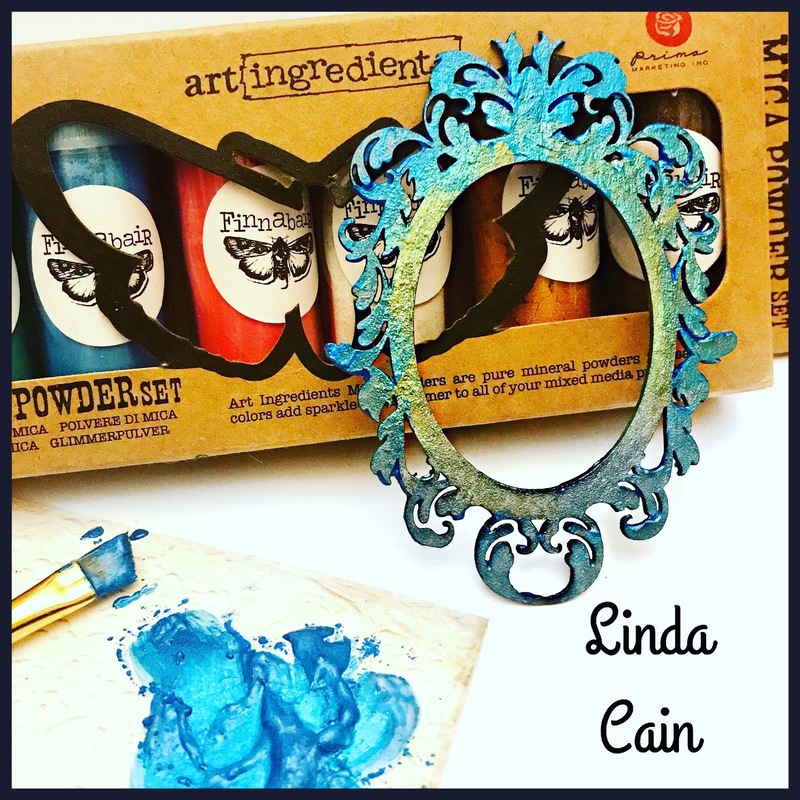 I add water to the Mica Powders to create an amazing metallic paint. I applied two colors to this Medium Baroque chipboard frame from Retro Cafe Art. Glue the picture to the frame and layer onto the box. I leveled off some of the high points of the texture, and added a piece of chipboard to the back of the picture. I like using Heavy Body Gel that is thick enough to level the frame. Add a tiny Pink Paper Rose with a touch of Blue Glitter and it's perfect. Simple, with maybe a bit of elegance. Always hard for me to do since I really love to keep going.....and going.... and going. Stop when you want, or keep going! It's completely up to you. 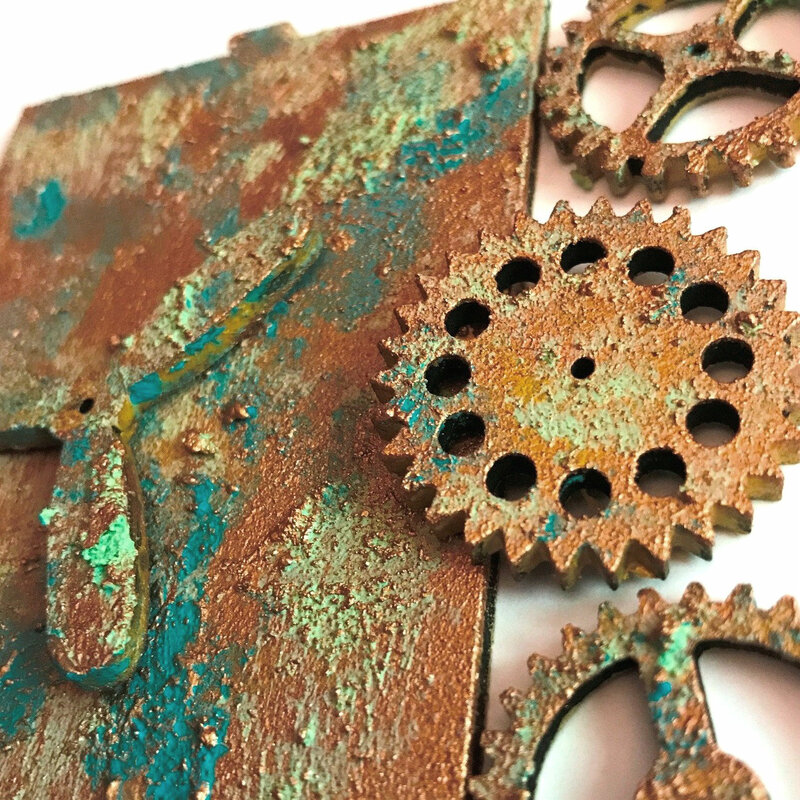 was just the right size to create a collage of gears and wings for a piece that could easily be for a Father's Day Gift. I lay out my pieces on the packaging that the shrine comes in, and then paint the pieces. When you're done, there's no cleanup, just toss the plastic sheet away and your'e ready to move on. Here I used the new Patina Pastes on all the outside pieces, over a base coating of Gold Rush Metallique Paint. 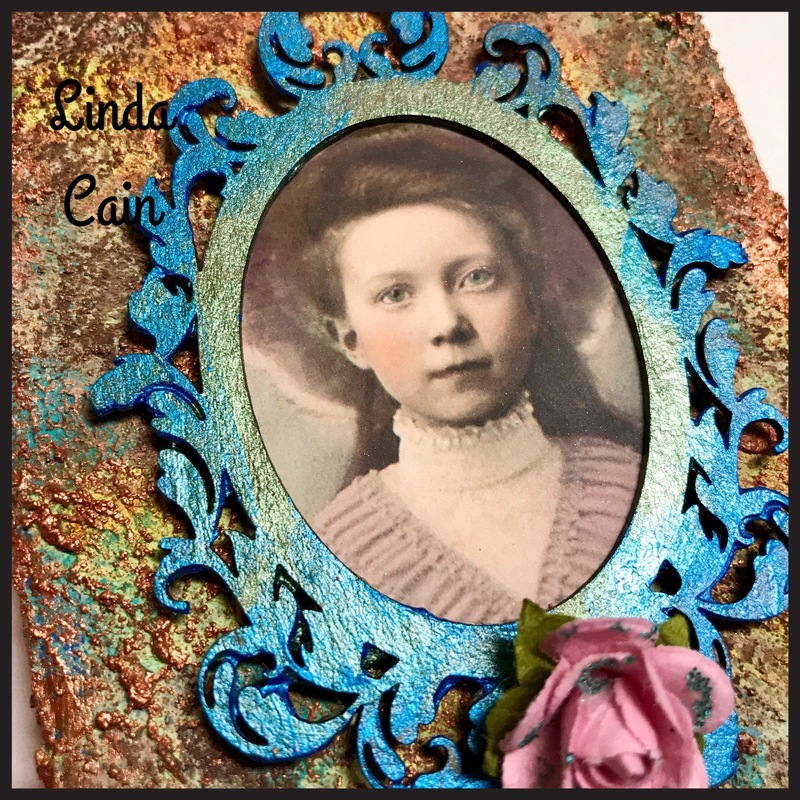 I used the same Gold Rush paint to the inside and added some stamped images with black Archival Ink. Put it together with a small amount of white glue and you're ready to decorate. I toned down the color a bit to make it more rustic with a bit of the Brown Rust Paste. The gears from the kit were used to make the collage base that I glued onto a large wooden block. 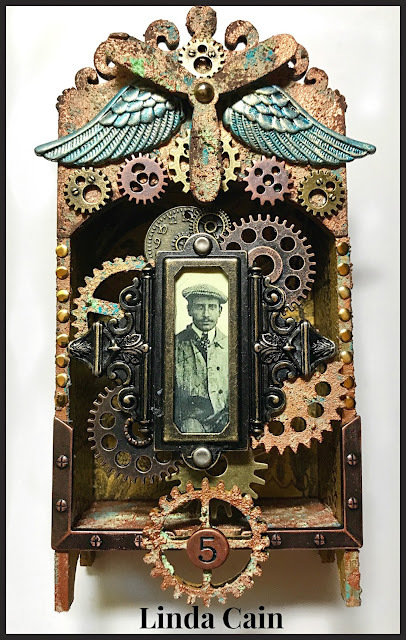 This raises the grouping of Mini Gears, Fancy Gear Charms, Small Antique Brass Steampunk Charms, and Copper Gear Mix, up from the back to make it more visible. 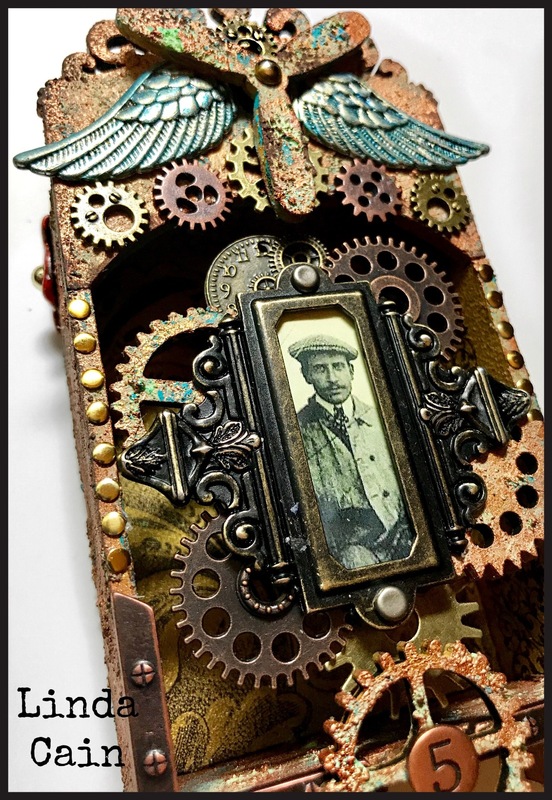 The Edwardian image of the man was added to the Ornate Plate and glued with Heavy Body Gel to the collage. The Wings were colored with Stream Alcohol Ink. I found these in my stash of charms that were for earrings. Hard to tell where I got them! But that's the fun of it sometimes. Whatchagonnado?!?! Add a couple of more copper pieces of ephemera, some Box Corners on the back, some tiny 3mm Brass Circles on the sides, and it's done. I'm thinking this would make a great Father's Day present for someone, but I just enjoy Steampunk pieces for myself. P.S. Click on all the links throughout the post for all the products you can get at Retro Cafe Art Gallery.